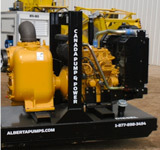 Mighty Naked Trash pumps are a cost effective pumping solution. These pumps are built to the same quality as our other pumps but designed with self priming technologies. These units use the shape of the volute to draw a prime without the use of any eternal sources. These pumps will draw a suction head of 21 ft. Mighty Pumps is setting the standard for Industrial Strength Pumps. Mighty Jet-Pumps are built for the industries that they are working in with Industrial Strength skids, trailers and construction.